Here’s an extract from a wonderful tongue-in-cheek review of the Gennett sound-effects records, which we found among Bill Bryant’s papers. Unfortunately it’s just a clipping, with a note that it was “from The New Yorker, c. 1940,” and those are all the details we have at the moment. 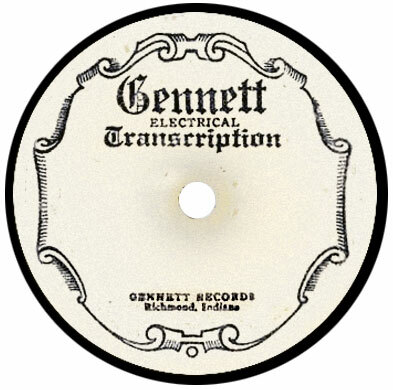 Harry Gennett kept his legendary label afloat into the early 1940s with these records, which were popular with radio stations. The catalog at one time listed 375 releases, and there are still a lot of them around. “Gennett’s chef d’oeuvre, however, is 1099A, demurely catalogued as ‘Man walking on gravel road, wearing squeaky shoes and corduroy trousers. Incidental bird calls.’ Baroque, certainly, but I love it. “The possessor of a complete set of Gennett Effects can say goodbye to dull evenings. You are sitting at home, let us imagine, alone and in the dumps. You conjure up a little gaiety with 1002B (‘Several Men Laughing’), and add a bacchanalian touch with 1096A (‘Putting Ice into Glass and Filling with Liquid’). Then you fall to cards (‘Shuffl­ing and Dealing Cards, or Rolling Dice’ — 1092A). It is a stormy night outside (1070B, ‘Rainfall and Thunder’). Suddenly a shot rings out (1007A: ‘Gun Shots’), and a woman screams (1003B). The police arrive in a squad car (1008B: ‘Six-Cylinder Automobile Running at Even Speed’) with the siren on (ll03A). They knock at the door (1133A: ‘Knocking and Pounding on Door’); then, failing to gain admittance, they chop it down (1092B: ‘Chopping Down Door’) and drag you off through a rapidly gathering crowd (1109A: ‘Crowd Yelling’). You can now go quietly to bed, satisfied that the neighbors are envying your thrill-packed life. Victor and others also offered their own sound-effects lines, although none were as extensive or occasionally bizarre as Gennett’s. Details of the Victor issues can be found in John Bolig’s new Victor Special Labels, 1928–1941, just released by Mainspring Press.